An historic first-ever place in a final is now off the cards for New Zealand but they still have much to play for after a 2-0 loss to Spain in the semi-finals of the FIFA U-17 Women’s World Cup in Uruguay. Coach Leon Birnie and his ground-breaking side will now look to become the first national team from their country to earn a medal when they take part in the play-off for third on Sunday morning (NZT). Despite their semi-final defeat, New Zealand will take plenty of confidence into that encounter after again proving they belong at the very highest level with a strong showing at a rain-soaked Estadio Charrúa in Montevideo this morning (NZT). “We knew today was going to be challenging but, in that first half especially, we really took it to them,” Birnie said. “There were long periods of that game where we had them camped in their half and we hit the crossbar. But we then switched off for their first goal and that was an absolute killer. They then showed their class with a great strike in the second half and it was always going to be difficult to come back from two-nil down,” he added. With the exception of fielding a fresh-look side in their final group game against Ghana, Birnie has retained a very settled starting line-up throughout the tournament and again kept faith with the group of players who have made history for their country, making no changes from the quarter-final win over Japan. There was no doubt they were coming up against one of the best sides in the world with Spain having won their European qualification and scoring 11 goals on their path to the semi-finals in Uruguay, conceding just two. But New Zealand had already beaten some top-class opponents on their own remarkable march to the final four so were not going to be overawed by the classy Spanish and showed they were more than capable of causing another upset in a tight first half. 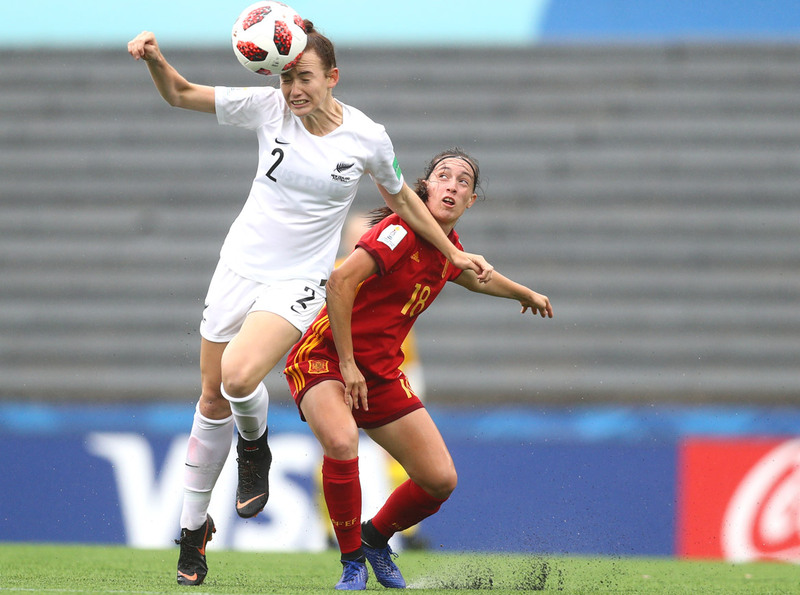 Despite all their possession, Spain were struggling to create anything going forward, thanks largely to several vital interventions from New Zealand’s inspirational captain Aneka Mittendorff. When the next good chance did arrive, it again went the way of the Oceania champions in the 26th minute, Gabi Rennie being played in down the right by Amelia Abbott but her shot from a tight angle couldn’t beat Spain goalkeeper Catalina Coll at her near post. Just a few minutes later, New Zealand went even closer to opening the scoring when Coll got the faintest of touches to a perfectly-placed strike from Macey Fraser and it bounced agonisingly off the crossbar. It wasn’t until the 34th minute that Spain came anywhere near to a goal themselves, captain Clàudia Pina glancing an effort off the base of the upright. The underdogs needed to begin the second half well to get back into the game but the highly-accomplished Spaniards weren’t about to let a place in the final slip through their grasp and extended their lead soon after the restart in stunning fashion. A loose ball dropped to Irene López outside the box and she unleashed a unstoppable volley that fizzed in off the inside of the post for one of the goals of the tournament. If any were needed, it was a reminder of the sort of quality the Kiwis were up against and they couldn’t produce a similar moment of their own as they looked to fight back from two down. New Zealand will now take on either Mexico or Canada in the play-off for third at the FIFA U-17 Women’s World Cup on Sunday morning (NZT). “The players will be disappointed tonight but we’ll refocus and if we can win that play-off game then that will be another special moment,” Birnie said.